If you are managing debt, try a balance transfer card to help you pay down debt faster by transferring an existing balance to a new card with lower interest. 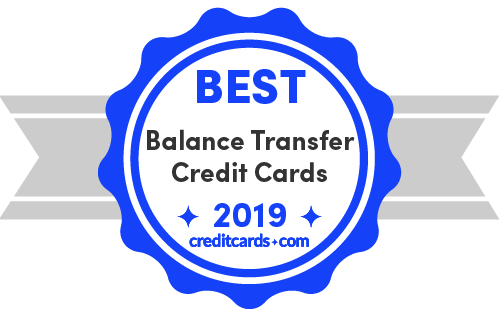 We analyzed over 1,000 balance transfer offers to find the best recommendations for you - compare our editor's picks for the 10 best balance transfer credit cards from our partners below and see how much each card could help you save. Estimated Savings is a CreditCards.com calculation that is used to provide an example of how much you might save by transferring your balances to a new card after factoring in fees, length of promotional periods and interest charges. This amount is based on the transfer amount and does not assume rewards or purchases, since those will vary per individual. Estimated savings are based on the following amounts: Transfer Amount: $2,500, Current APR: 15.00%, Monthly Repayment: $56.25, Savings Period: 24 mos., with the Intro Balance Transfer Period at the Intro Balance Transfer APR rate, plus any remaining months at the Regular APR. Either $10 or 4%, whichever is greater, will apply on each balance transfer and credit card check. Either 3% of the amount of each transfer or $5 minimum, whichever is greater. We found that a whopping 49% of American adults wrongly thought that you can't transfer a balance to a new card and pay 0% for more than a year. Polling 1,259 people from Oct. 5-8, 2018, YouGov PLC found for us that only 51% of those polled correctly answered that statement as true. So, yes, balance transfer cards are a good way to address that debt – and more. You might want to consolidate your debt. Or perhaps you want to stop paying prohibitive interest charges. There are a number of reasons for obtaining a balance transfer, all excellent ways to save money and improve your budgeting skills. However, it's important to learn from your mistakes, and recognize what got you in the financial straits you are in in the first place. That means start a budget that includes room for fun and saving. Is a balance transfer card right for me? How much can you transfer to one credit card? Not sure what the pitfalls are? Want to know more about how to use a balance transfer card? We can help. The best balance transfer credit card is the Wells Fargo Platinum Visa card due to its lengthy 0% intro APR offer of 18 months (then 17.74% - 27.24% variable). The Discover it Balance Transfer is another balance transfer card that can help you save money with its interest-free period of 18 months for balance transfers and low regular APR of 14.24% - 25.24% variable. Length of 0% intro APR period: A good balance transfer card should have an introductory 0% APR period of at least 15 months. In a few cases, a card with a shorter intro offer may be worth it for its other benefits but if balance transfers are your primary intended use, then the longer the better. Balance transfer fee: If you have a large balance to transfer, this fee can become quite costly. We only considered credit cards with balance transfer fees of no more than 5%. Regular APR after intro period: Ideally, you want to pay off your balance before the 0% intro APR period is over. However, if this is not possible then you should keep an eye out for cards with reasonable regular interest rates. Annual fee: The entire point of a balance transfer credit card is to avoid paying more than you have to; paying an annual fee would run counter to that goal. The best balance transfer credit cards have no annual fee – you'll notice that we've eschewed cards that charge such a fee in compiling our list. Here is our breakdown of the top balance transfer credit cards that can help you save on interest. Analysis: This card has the unusual feature of 0% APR for 18 months on both purchases and balance transfers. The regular APR weighs in at a high 17.74% - 27.24% variable, so you'll definitely want to pay off your balance before 18 months end. Also keep in mind that you must make your balance transfers within 120 days in order to qualify for intro rates and fees. During the first 120 days, the balance transfer fee is a lower 3%, but goes up to 5% after that. You can also get up to $600 protection on your cellphone (with a $25 deductible) for covered damage and theft when you pay your cell bill with this card. Bottom line: This card an unusually long 0% intro APR offer; just make sure you are aware of the caveats and pay off your balance before the high regular APR kicks in. Analysis: This card doubles as a cashback card and a balance transfer card, but it's important to stay on top of any new purchases so you don't carry a balance that incurs interest charges. As long as you pay down at least the balance of the new purchases after the first 6 months and before 18 months, you won't incur interest, and you'll fully benefit from the cash back. The Discover it Balance Transfer gives you an excellent 18-month 0% intro APR on balance transfers (14.24% - 25.24% variable APR), as well as 5% back on select rotating categories up to the quarterly max each time you activate, and cash back match at the end of your first year. So, if you spend $500 a month on select categories, you can earn $600 – $75 a quarter for your purchases plus $300 at year end. Bottom line: If you're looking for a card with a generous intro APR on purchases, look elsewhere – this one has a paltry 6-month 0% APR (then 14.24% - 25.24% variable). But with a generous balance transfer offer and rewards, this card can be a great addition to your wallet. Analysis: While the Quicksilver's 0% intro APR on purchases and balance transfer is 15 months, the regular APR ranges from 16.24% - 26.24% variable. It has a flat rate on all purchases of 1.5% cash back and there's also a $150 cash bonus after a $500 spend within the first 3 months of opening your account. Bottom line: The Quicksilver' is good for balance transfers—thanks to its long introductory offer—and comes with a nifty sign-up bonus. Also, there's a flat rate of 1.5%, so you don't have to think about what types of purchases you are making. Analysis: All in all, this credit card is fairly straightforward. Its 0% APR period is a solid 18 billing cycles (then 15.24% - 25.24% variable) when transferring within the first 60 days. This allows for plenty of time to pay off purchases and balance transfers. Importantly, there is no penalty APR, meaning that your APR won't go up automatically if you pay late (although you should still always avoid paying late). Beyond that, there's not a ton of fancy benefits, but one noteworthy feature is access to your FICO credit score for free. Bottom line: If you need a balance transfer card that gets the job done and you don't mind the lack of bells and whistles, the BankAmericard is a good choice. Analysis: This card offers a respectable 15-month introductory offer of 0% APR on purchases and balance transfers (then 17.24% - 25.99% variable). The card's primary emphasis is on cash back, where it is one of the most popular credit cards. Bottom line: The Chase Freedom Unlimited is a decent balance transfer card with a heavy focus on earning cash back. For balance transfers, there are credit cards with more favorable rates. Analysis: The U.S. Bank Visa Platinum card offers one of the best 0% introductory APR offers on the market right now at 20 billing cycles, which is phenomenal if you need more time to pay off an outstanding balance. The variable APR of 14.74% - 25.74% also starts relatively low, so if you have excellent credit and need to carry a balance, it is a reasonable interest rate among low interest credit cards. Bottom line: This card should be one of your go-to choices if you have excellent credit and need to pay off a balance over an extended period of time. Analysis: This card boasts an excellent offer with its 15-month 0% intro APR on both purchases and balance transfers. The regular ongoing rate of 14.24%, 20.24%, or 25.24% variable applies after the intro period ends. The HSBC Gold's versatility stands out, as it carries no penalty APR, no annual fee, and no foreign transaction fees. Bottom line: This card is good for consumers looking for flexible terms and low regular interest rates alongside a strong intro APR offer. Analysis: This card boasts excellent value alongside its 15-month 0% intro APR on both purchases and balance transfers. The regular ongoing rate of 15.24% - 26.24% variable applies after the intro period ends. The BCE's rewards stand out, as you can earn 3% cash back at U.S. supermarkets on up to $6,000 of purchases per year before it goes to 1%. You earn 2% at U.S. gas stations and U.S. department stores, and 1% on all other purchases. Bottom line: While the BCE is mainly known as a great cash back credit card, it also offers very solid terms and rates that make it competitive with other top balance transfer cards. Analysis: As a cash back card with a serviceable balance transfer offer, this card is a decent choice for consumers who are keenly focused on earning rewards. With the U.S. Bank Cash+ card, you can earn a $150 bonus after spending $500 in the first 90 days, and 5% cash back in your selected two categories (on up to $2,000 in combined purchases per quarter). While the rewards are solid, the length of the 0% APR period stands at 12 billing cycles for balance transfers, with a regular APR of 16.24% - 25.74% afterwards. Bottom line: Unfortunately, there is no intro APR offer on purchases and the balance transfer offer is on the shorter side, but the card is great for those looking for cash back. Analysis: This card has the rare feature of an 21-month 0% intro APR on balance transfers, although the balance transfer fee is high at 5% or $5, whichever is greater. The regular ongoing rate of 16.24% - 26.24% variable applies after the intro period ends. Bottom line: This card offers no rewards, but it offers no late fees and no penalty rate, and the 0% intro APR offer is superb. What are balance transfer credit cards and how do they work? Card debt for the American consumer can be crushing – it averaged $8,195 per bank card (including retail cards) in our recent survey on credit card debt by state, up from $6,354 in 2017 (according to Experian). Meanwhile, we found that the states with the least debt burden had a higher median household income: Massachusetts, Wisconsin and Minnesota, with Massachusetts having the least debt burden. If you find yourself strapped with interest charges and a cycle of never-ending debt, there is a way to pull yourself up and out, and that is with balance transfer cards. Balance transfer cards are credit cards that allow you to move debt from one card to another – essentially paying off credit card “A” with new credit card “B.” Typically, a person will transfer his or her balance to a card with a lower interest rate, allowing them to save money on monthly payments or pay off the balance more quickly. For example, if you're paying 12 percent interest on a $3,000 debt, you will have to pay $560 per month for six months to pay off the balance. If you transfer that $3,000 balance to a card that doesn't charge interest for the first six months, your payments will be $500 – for a savings of $60 each month. As CreditCards.com industry analyst Ted Rossman points out, "Balance transfer credit cards are an excellent tool for getting out of debt at the lowest possible cost. At present, the best offers are 0% interest for 21 months (with a 5% transfer fee) or 0% interest for 15 months (with no transfer fee). Take advantage of these promotions and be careful to avoid running up more debt once you've worked so hard to get out of it." How do balance transfer fees work? Most balance transfer cards charge a balance transfer fee that is typically 3%-5% or $5-$10, whichever is greater. When you request a transfer, you will likely be allowed to transfer up to 100% of your credit limit, minus the fee. There are some cards that offer no fee, however. We found in our January 2019 balance transfer survey that there was actually an increase in no-fee balance transfer cards – of 100 cards, 15 balance transfer cards offer no-fee transfers, up from 9 in our December 2017 survey. In the 2019 survey, 8 others offer either an introductory lower fee or waive the fee entirely if you make the transfer in a set amount of time. Sometimes the waived fee comes after the introductory offer ends, as with the Barclaycard Ring. Apply for a balance transfer card – Before choosing a card, check out our balance transfer calculator, which factors in fees and interest rates to determine how much you'll save by transferring your existing balance to a different card. Once you find the balance transfer card that best suits you, complete the card application. Collect your information – Next, gather the account details for the card that has the debt – referred to as the “transfer from” card – including the account number and card balance. Contact customer service – After receiving your balance transfer card, call customer service and inform them that you want to transfer a balance onto your new card. Once you provide them with the necessary information, they will reach out to the old card company and move the requested amount onto your new card. Many cards also allow you to make balance transfers through your online account, but Nuata advises that you should wait until you receive the physical card to initiate a balance transfer. "This is the best method because when you do the transfer online, you may not receive a credit line high enough to cover the transfer(s). If you wait until you receive the card, you can always call the bank and explain the situation and request a greater line of credit." Balances can take up to three weeks to transfer, so we recommend that you pay the minimum amount on your card before transferring the debt to avoid late fees and other penalties. Also, be sure to transfer your balance before the card's introductory offer ends. Usually it makes sense to transfer as much of your debt as possible onto a 0% card to minimize your interest payments – but not always. Balance transfer cards usually carry higher-than-average APRs, and if you can't repay the balance before the introductory period, it could potentially cost you more in interest rates and fees than if you leave the balance where it is. If your current account has a lower interest rate, you should do some math to figure out whether transferring all of your balance or just a portion of it will cost less. You're not off the hook once you've transferred your balance – you need to pay it off in a timely manner so you don't end up racking up a ton of interest on it. Have a plan in place that includes monthly installment payments before you do the transfer. Be sure to send your payment by the due date to avoid penalty fees. In fact, check the card's terms and conditions, because making a payment even a day late may result in you losing your 0-percent introductory rate. Set up an automatic payment through your bank and schedule it a few days before your due date to be on the safe side. You should try to pay off your balance before the regular APR kicks in. However, you should also take into account balances on other cards. You may want to focus on paying down accounts with higher interest rates first, and then make larger payments toward your 0-percent card once you've paid off your other accounts. Don't get yourself in more debt. Incurring new debt could undermine your ability to repay your balance transfer before the introductory period expires, and unless your new card includes a 0% introductory period for new purchases, you will immediately start incurring interest on that new debt. Put your new card to the side until you've finished paying it off. Don't close down your old account once you've transferred your balance from it, especially if you've had it for a long time. Doing so could significantly lower your credit score, by lowering the average age of your accounts and raising your credit utilization ratio. However, you don't want to incur new debt either. Instead, put a small charge on the old card and pay it off in full each month to keep the account active. Consider how you accumulated a large balance and steps you need to modify your spending habits. Perhaps the balance was the result of an emergency that couldn't be avoided. Or maybe you are living beyond your means. Create a budget and seek the help of a credit counselor. Here are a few pros and cons of using a balance transfer card. Increase overall credit limit – By taking out a BT card after buying that new freezer, for example, you are increasing your credit limit. This automatically decreases your overall credit utilization ratio, which is a good thing because that means you have a higher limit compared to the same amount of debt. This is assuming you don't incur new debt and you keep your old card. Consolidate monthly payments – Instead of keeping track of several card balances and different payment due dates each month, you can streamline your payments by transferring debt from various cards to a single card. Save money on interest - You can save money on interest and pay off your debt faster when you transfer your balance from a high-interest card to one with a promotional 0% interest rate. Specifically, you should aim for 0 APR credit cards rather than just a card with lower interest than your current one. According to Rebecca House of American Financial Solutions, "One of the most common things I see is people using balance transfers to lower payments rather than to get out of debt. If you are transferring a balance solely for lower interest, you may be setting yourself up for financial failure. Use a zero percent interest rate to focus on getting out of debt and have a plan for making that goal a reality." Transfer non-credit card debt – Balance transfers are not limited to credit card debt. You may also be able to transfer car loans and monthly installment payments from appliances, furniture and more. Possible negative impact on your credit score – While transferring a balance won't necessarily affect your credit score, applying for a new balance transfer card will. Additional fees – Many balance transfer cards charge balance transfer fees. Exposure to more debt – Once you transfer your balance to a new card, you may be tempted to continue racking up debt on your old credit card. Additionally, if you don't have a plan in place, you risk carrying your old debt with a higher interest rate should you fail to pay it off before the 0% offer ends. You may get a higher interest rate – If you don't have excellent credit, you typically won't be approved for promotional interest rates. Instead, you will only qualify for the regular, higher interest rates. For those struggling under the weight of heavy credit card debt, a balance transfer card can offer a great opportunity to lower your interest payments and pay off your debt more quickly. If you have debt, perhaps from going overboard with gifts for the kids, you may have thought about getting a balance transfer card. However, a balance transfer isn't always the best way to address your old balance. There are a few important things to consider before making your decision. First, determine if you can pay off your current balance quickly. If you can pay your current balance off in six months or less, transferring your debt may not be worth it. Second, consider your credit score. If your credit score is below 670, or below "good" credit, you most likely will not be approved for a low interest balance transfer offer or a 0% introductory offer. Remember: The main reason to transfer your balance to a different card is to get a lower interest rate. Finally, it is important to be a responsible cardholder. If you have a difficult time making credit card payments on time, you should think twice about getting a balance transfer card. In addition to racking up expensive late fees, issuers will typically cancel any promotional interest rate offers if you pay your bill late – meaning, you could be responsible for high interest payments right away. Double down on payments. If your balance is already on a low-interest card, you might consider doubling down on payments and get rid of the debt quickly to minimize interest charges. This is also applicable for other forms of low-interest debt, such as student loans. Talk to your card issuer. You may be able to reach your goal without getting a new credit card. Talk to your current card issuer about lowering the interest on your card, which would save you the cost of a balance transfer fee. Get a personal loan. Depending on your situation and the offers available to you, it might make more sense to consolidate your debt with a personal loan. Each option has pros and cons, so weigh your options before you decide. Is it a true 0-percent APR card? Be on the lookout for cards with deferred interest deals. Deferred interest means just that — if you don't repay every last cent of your balance by the end of the introductory period -- you will owe interest for all of the preceding months. A true 0-percent balance transfer card does not charge interest during the introductory period (as long as you make your monthly payments on time), even if you are still carrying a balance at the end of the introductory period. How long is the introductory period? What is the regular APR? Behind a 0-percent introductory offer often lies a very pricey regular APR. Make sure you know exactly how much you are going to be paying in interest once the introductory period expires, so you aren't caught off card. And keep an eye out for low-interest-rate cards that offer a reasonable APR in combination with a 0-percent introductory APR. Is there a 0-percent APR on new purchases? Some cards offer a combination of a 0-percent APR on balance transfers and new purchases. We don't recommend using your card for new purchases until you've paid down your balance, but a card with a 0-percent APR can be useful if you have to use your new card in a bind – at least you won't incur interest on that new balance. Some balance transfer cards include an annual membership fee – try to avoid any cards with annual fees until you've dug yourself out of debt. What is the penalty for missing a payment? Take a careful look at the card's terms and conditions to see what's in store if you send a payment past the due date or completely miss a payment. Possible penalties can include losing your 0-percent introductory APR (even for paying just a day late), penalty fees and interest and penalty APRs of nearly 30 percent. You should opt for a card with more forgiving terms. What are the other features? Is there a rewards program? Since you shouldn't be making new purchases with a balance transfer card, rewards programs shouldn't be your primary concern. But they're a nice-to-have in case you want to keep the card in the long run, along with other card benefits such as purchase and travel protections. A misstep with a balance transfer card can be costly, so you should familiarize yourself with all the restrictions in the card's terms and conditions. Other things to consider: how long do you have to transfer a balance at 0-percent and/or with the balance transfer fee waived? Is there a grace period for new balances? Are there other unexpected fees or penalties? Make sure there's nothing in the fine print that could catch you off guard. When comparing balance transfer cards, your gut may tell you to choose the card with the longest introductory period. You're not entirely wrong, but there's another very important consideration: The balance transfer fee. Most balance transfer cards charge a 3% to 5% fee to transfer a balance, which can add up to $100 or more in fees if you have a large balance to transfer. How much can you afford to pay each month? – How much can you reasonably afford to pay on the balance each month? While it's a good idea to pay down your debt as quickly as possible, you should come up with a manageable amount. Once you know the size of the balance transfer and the installment amount, you need to calculate the fees and interest for each card. Basically, you need to calculate how much of a balance remains for each card once the introductory period expires (don't forget to add the card's balance transfer fee to the initial balance), and then calculate the interest that you will owe each month until the balance is paid off. Using the same balance transfer amount and installment payment, calculate the fees and interest for both cards, then compare the amounts side by side. For example, in the table below, we compare the costs of transferring a $5,000 balance to the Discover it Balance Transfer card and the Amex EveryDay* cards with a repayment period of 21 months. Even though the introductory period on the EveryDay is shorter, you would save more than $100 with it in this scenario, due to its waived balance transfer fee. Finding the card that will cost you the least to pay down your balance should be your first priority. However, if all else is equal between the cards, you should look at remaining features on the cards to see if either is worth holding onto in the long run. For instance, the Discover it Balance Transfer card from our example has a very valuable cash back program. You can enroll every quarter to earn 5% cash back on up to $1,500 in purchases made in various categories throughout the year. While there have been reports of card issuers allowing a percentage below the credit limit for balance transfers, our research shows that major issuers typically say they allow 100% minus the balance transfer fee and any outstanding charges. Your credit limit is primarily based on your credit score and your income. But how much will your credit limit be? Just as you don't know if you will get the card until the issuer says you have, your credit limit is likewise a bit of a mystery until you've been told what it is. However, the American Bankers Association tracks consumers' credit limits on new credit cards, so we do have some idea what your limit might be. That said, it is worth your while not to max out any card, because it can impact your credit score due to your utilization ratio, which is the amount you owe divided by the amount of credit you have available. Sometimes, you are approved for a balance transfer card but when it comes time to make the actual transfer, it is rejected. What to do? If the balance transfer is denied – Simply ask the card issuer to reconsider. The reason why you were denied can be the deciding factor. If your credit is poor – If your credit score was too low or you don't have high enough income, you may be denied. Sometimes you can get approval if there are extenuating circumstances. If it's due to lack of available credit – Try resubmitting with a lower amount. If your first problem hasn't been solved (transferring the old balance), you might consider another card. Just make sure you have sufficient income and credit score for that card. Keep in mind that each hard inquiry impacts your score by about 5 points. * All information about The Amex EveryDay® Credit Card from American Express has been collected independently by CreditCards.com and has not been reviewed by the issuer. The Amex EveryDay® Credit Card from American Express is no longer available through CreditCards.com. ** All information about Chase Slate® has been collected independently by CreditCards.com and has not been reviewed by the issuer. The Chase Slate® credit card is no longer available through CreditCards.com.